Once upon a time, I grew up in the same town my whole childhood. Once upon a time, all of my grandparents and many of my aunts and uncles lived minutes away. Once upon a time, I had no concept of what my military friends experienced as a normal part of their lives. The lives my own children have now lived for their entire growing up. With April’s Month of the Military Child upon us, I’ve been thinking about not only how special our military kids are, but how much I’ve learned from them. 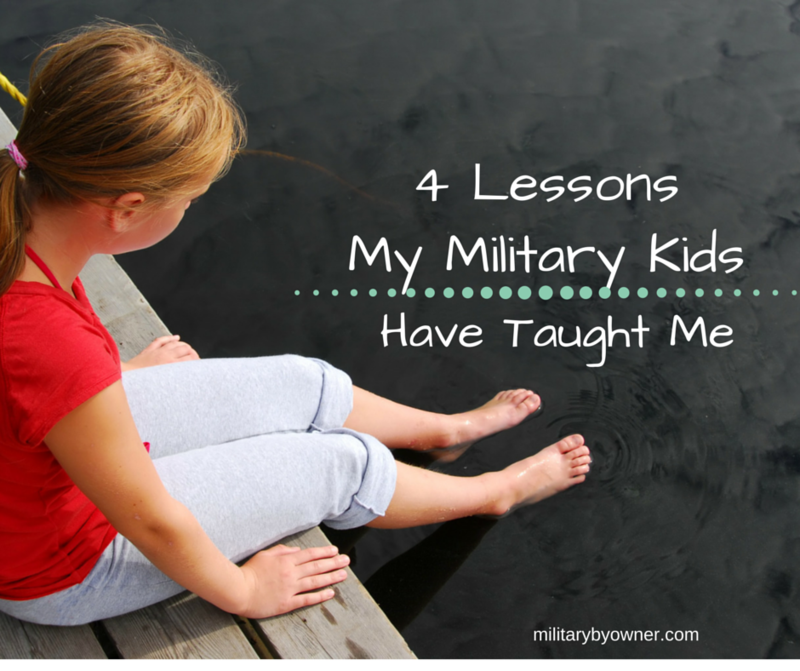 While I can’t distill every lesson I’ve learned into a quick list, a few qualities come to mind when I think about my awesome "military brats." Patriotism, openness, and flexibility come to mind. What else would you add to this list? 1) How to start over. Again and again and again. While I’m not going to gloss over the hardships they’ve faced in their short lives (repeated separations from their dad through deployments and TDYs, moving every few years), I’m always amazed at my kids’ ability to start over again and create a new life for themselves, wherever we are. 2) How to be a friend. My kiddos recognize and treasure genuine friendship when they see it. They don’t hesitate to reach out and talk to the “new kid,” because they’ve been the new kid more times than they can count. Another trait I’ve noticed about most military kids I’ve encountered is the lack of racism and judgment. They’ve lived all over world, usually around more people that are unlike them than are, and have a knack for simply accepting people for who they are. In fact, they seem mystified by those who focus on silly outward qualifiers in order to be friends with another person, whether it’s the latest trend, skin color, or where they’re from. They’re true children of the world. While this is an emphasis and something of a catch phrase in the military right now, I think we need look no farther than our nation’s military kids to see a true picture of resiliency. How much is asked of these who have no choice in the matter! They make me want to be a better person. 4) Appreciate the little things. “Mommy, wook!” This was the delighted squeal of my three-year-old daughter every time she turned on the light switch and it responded with--wait for it--actual lights turning on after our time stationed on a small island in the Pacific. We’d been through several typhoons complete with weeks-long power outages and near daily unexplained power failures as a matter of daily life. It made me giggle every time she did that, and her appreciation lasted months after we'd moved. Her joy at something so simple made me realize how much I take for granted! Everyone has their own set of challenges. My kids have taught me to forge on in the face of unwanted circumstances, to be brave in times of uncertainty, and to “fake it till you make it” with a good attitude when nothing seems to be going right and military life takes a toll. I’m so glad I get to learn from them.